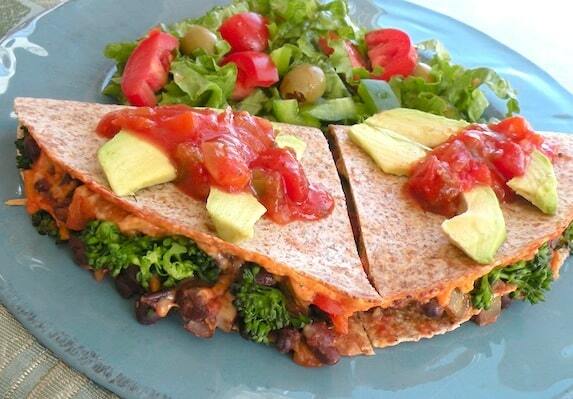 These generous quesadillas, filled with black beans, broccoli, and portobella mushrooms, make a substantial one-dish meal that’s easily completed with a simple salad on the side. Using a judicious sprinkling of vegan cheese make these extra yummy, but if you object to vegan cheese, skip it. Note, however, that there will be nothing “queso” about these quesadillas, which are essentially embellished grilled cheese sandwiches made with tortillas (and usually embellished with other ingredients). You can dress these up as you’d like with all the optional ingredients, or keep them simple with just the 6 essential ingredients! A good prepared salsa plays an important role in these, so make sure to choose a flavorful variety. If you’d like to bake these, preheat the oven to 400 degrees F. Otherwise, follow the instructions for cooking on the stovetop. Steam the portabella slices in a skillet with a small amount of water, covered, until they soften. Add the broccoli and continue to steam, covered, until it’s bright green and tender-crisp. Remove from the heat and drain. Combine the beans and salsa in a mixing bowl. If the tortillas you’re using are less than 10 inches in diameter, you’ll be dividing the ingredients between 4 tortillas; if 10 inches or more, divide among 3 tortillas. To bake in the oven: Lay a tortilla on a baking sheet. 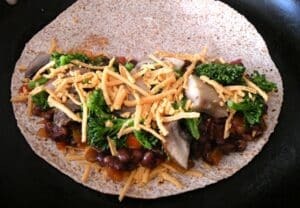 Sprinkle one half of it with a little vegan cheese, then spread that half of it with 1/4 to 1/3 of the black bean mixture, followed by 1/4 to 1/3 of the broccoli and mushroom mixture, depending on the size of the tortilla. Sprinkle with cilantro, scallions, and/or chilies, if desired. Sprinkle with a little more vegan cheese, then fold over to cover. Repeat with the remaining tortillas. Bake for 10 minutes, or until the tortillas begins to turn golden and crisp. Watch carefully! 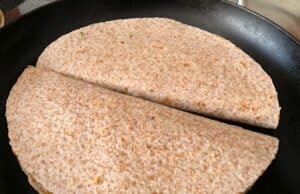 To cook on the stovetop: Follow the same instructions for assembling the quesadillas as above, doing so right on a heated skillet or griddle (no oil needed). If your skillet or griddle is wide enough, you can cook two at a time. Cook over medium-high heat until golden and crisp on both sides, about 3 to 5 minutes per side. You’ll need an extra-large spatula to flip these! 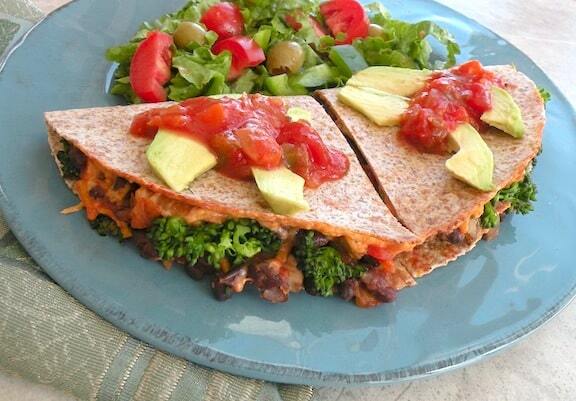 Find more of VegKitchen’s Vegan Dinner Recipes and more Burritos, Enchiladas, And Tortilla Dishes. Took this recipie out for a spin; I made it with 8 inch tortillas instead of 12″, Pace© Picante sauce, Red pepper seasoning, and frozen broccoli which I boiled. It was very delicious! Although I added a bit too much red pepper spice to it so it was a bit hot. But luckily the left over broccoli made a spelndid side dish, and my parents enjoyed it too. Made this tonight — half with flour tortillas and half with gluten free tortillas. Half with the black beans mixed with the salsa, and half without because my kids don’t like spicy food and the only salsa we had was very spicy. But they were all delicious. So easy, so fast, and really yummy. Gotta love Daiya. What did I do before Daiya?? Yum! Made this tonight with millet instead of wraps. Baked in the oven with steamed broccoli, baby portabellas, fresh corn, Daiya cheddar, black refried beans – we loved it! Thanks. These sound delicious! Next time I make quesadillas, I’ll give these a try. Broccoli just started showing up at the local farmers market, so it’s a great excuse to get a head (or two)! What temp did you bake these on? Hey vegan mom — as the recipe states, you’d bake them at 400 degrees F., if you’re not cooking them on the stovetop.